You are here: Home / News / Uncategorized / What does my Donation Support? The Diocese of Rapid City Chancery building is the center of diocesan ministry and is the office of the Bishop and his staff. The current Chancery was built in 1975 when the operations of this diocese were much smaller in scale. To more effectively Live the Mission of Jesus Christ, programs and staff have expanded over time but can no longer fit within the confines of the current building. Bishop Gruss’s Diocese Priority Plan laid out a vision for a new building for his staff and a change in name as well. The new “Pastoral Center” name better reflects the activity that takes place in the building. The Diocese of Rapid City recently entered into a $4 million purchase agreement with Black Hills Federal Credit Union to buy their current building at 225 Main Street in downtown Rapid City. Renovation costs are to be determined but are expected to be less than initial estimates and significantly lower than the construction of a new building. This new location brings the opportunity for greater witness in the heart of Rapid City, where many people from the region come to work and engage in their daily business. The new Pastoral Center allows the Bishop and his staff to be not of the world, but in the world—with a greater awareness of public needs and issues, sharing the witness of our work where the population is most dense. We, the Diocese of Rapid City, are blessed to have extraordinary priests carrying out the mission of Jesus in Western South Dakota. Their service and ministry strengthens and deepens the faith of our brothers and sisters in Christ. This lifetime of dedication is deserving of support even when our priests have moved on from active ministry and into retirement. 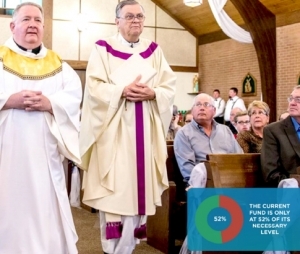 Our priest pension plan provides a stable monthly income and health insurance for retired priests. But, the plan is currently at only 52% of its necessary funding level. An additional $1 million for the pension would move it closer to being fully funded. Additionally, annual assessment contributions from our parishes to the priest pension plan will be reduced. 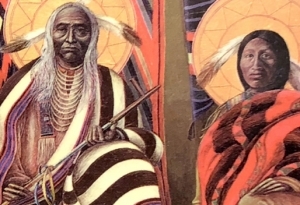 Over 25% of our catholic population in Western South Dakota is Native American. Their faith and culture are an essential part of our diocese and contribute to the vibrancy of our catholic community. Our diocesan priests have served and ministered to our Lakota brothers and sisters since 1996 on Standing Rock and Cheyenne River reservations. 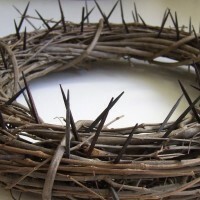 The needs for this ministry are great and outside funding sources continue to decrease. An endowment supporting the works of this diocese on the reservations would create a foundation of funding for years to come. An essential mission of our Diocese is forming young disciples to go out and share the message of Christ with the world. The Rapid City Catholic School System accomplishes this mission through an outstanding academic curriculum and a transformational catholic education. Carrying out this vital work are the teachers and staff of our Catholic schools. 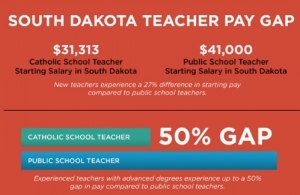 An increased endowment will allow salaries to be increased to a more competitive level and attract quality educators. Additionally, funds from the endowment will provide tuition assistance making a Catholic education affordable for more families. The mission of forming young disciples also includes attending to our students’ basic needs. The current kitchen and cafeteria at St. Thomas More High School is operating at 200% capacity and needs upgrading. Because of space restrictions, some students begin eating lunch at 10:40AM and others continue to eat until 1:30PM. A key piece of Living the Mission—A Legacy of Faith, A Legacy of Givingis to provide a new kitchen and cafeteria for the students of St. Thomas More. An expanded kitchen and cafeteria would allow for all 500 students being served to eat on a more regular schedule. 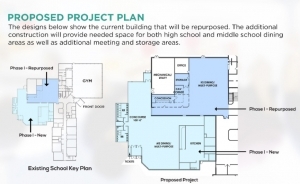 This increase in space would also be available for multipurpose use for both the school and the community at large.